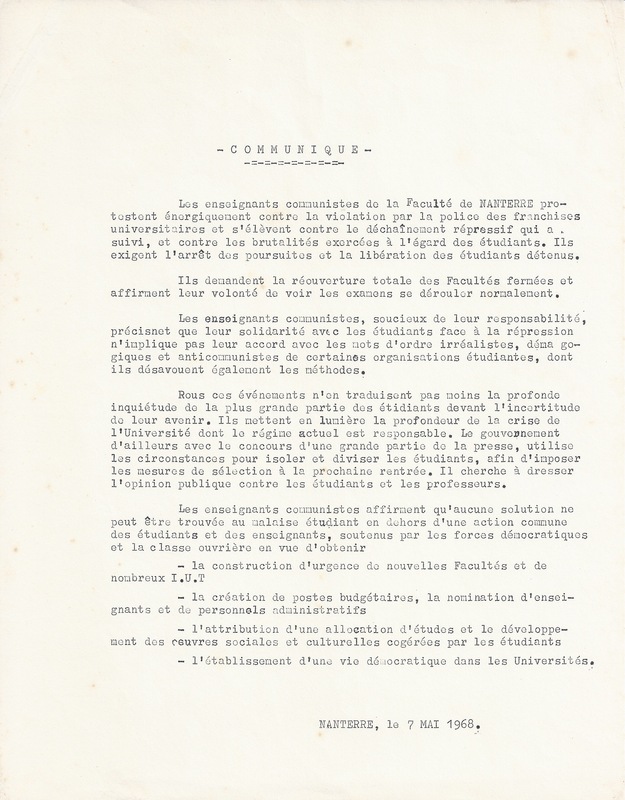 The Communist teachers of the Faculty of NANTERRE vigorously protest against the police violation of academic freedom, the repressive outburst that followed, and the brutalities exercised against the students. They demand the cessation of these activities and the release of students who have been detained. They call for the full re-opening of closed Faculties and affirm their wish to see examinations proceed normally. The Communist teachers, conscious of their responsibility, specify that their solidarity with the students against repression does not imply their agreement with the unrealistic, demagogic and anti-communist slogans of some student organisations, they also repudiate such methods. These events are no less than a reflection of the deep concern of the majority of students about the uncertainty of their future. They highlight the depth of the crisis of the University for which the current regime is responsible. Moreover, the government with the support of much of the press, have used these circumstances to isolate and divide the students, in order to impose measures of selection in the coming year. They seek to turn public opinion against students and teachers. – The establishment of democratic life in the Universities.